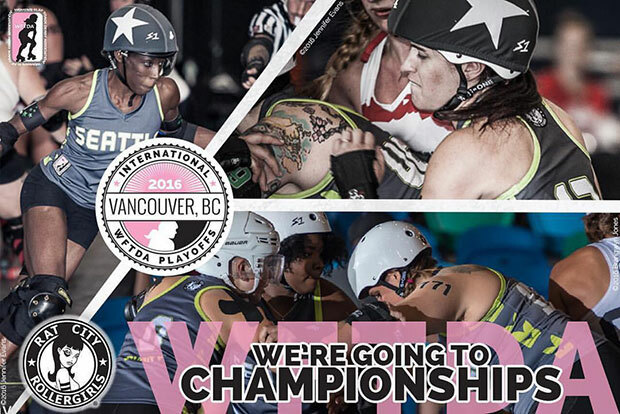 Hard work and dedication have paid off for the Rat City All Stars – two wins in Vancouver earned them a ticket to the 2016 WFTDA Championships! Our All Stars kicked things off with a victory over the Naptown Roller Girls of Indianapolis on Friday afternoon. The victory sent them into the next round to face Angel City on Saturday. Hoping for a repeat of the upset they pulled off at the Hometown Throwdown, RCRG All Stars fell to Angel City and would face Philly for a shot at third place. It was deja vu – the two teams had squared off in 2015 for the third place ticket to WFTDA champs, so our All Stars took the track knowing exactly what they had to do. It may have been one of the tournament’s most electric games – Rat City maintained a lead throughout the game but Philly brought it within a single point in the second half. In the end our All Stars came out victorious 134-114, earning bronze in the tournament and punching their tickets to Portland. RCRG All Stars are training hard for champs. You can get tickets now to cheer them on in person – the tournament starts November 4, rain or shine!